A peek into the treasures to be found in the May auctions. 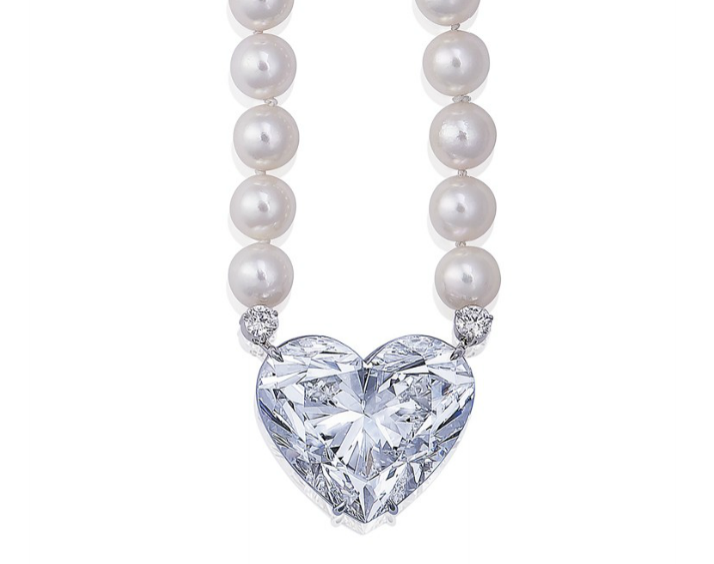 Set with a heart-shaped diamond, weighing approximately 92.15 carats. 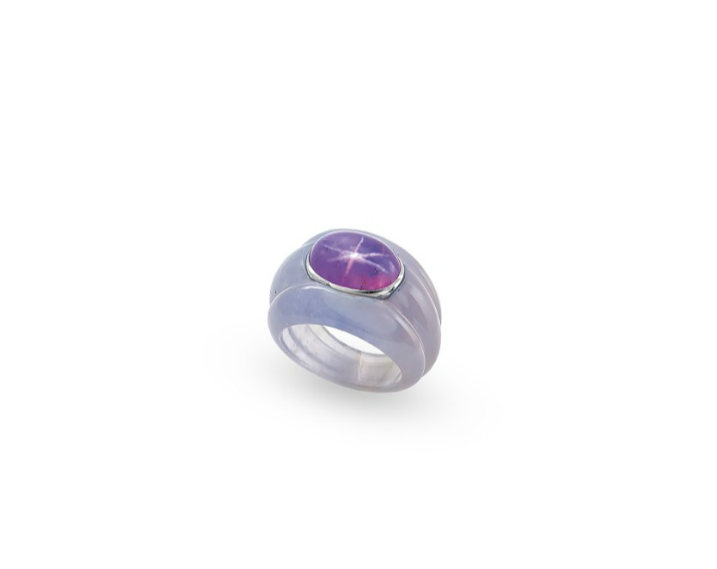 A colored star sapphire and chalcedony 'bourrelets' ring by Suzanne Belperron. 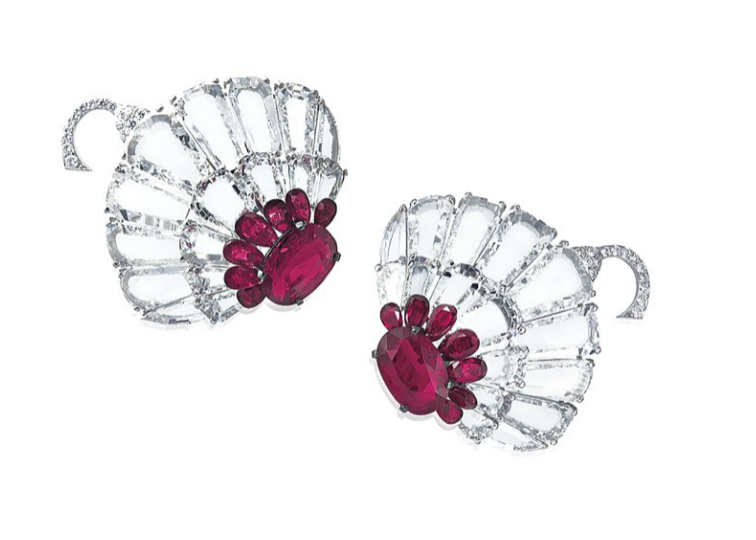 A pair of ruby and diamond earrings by Bhagat. Stylised lotus flowers with central rubies surrounded by flat diamond petals. In the culmination of Geneva Luxury Week, the Magnificent Jewels auction features a fantastic 92 carat D Flawless heart-shaped diamond pendant, named ‘La Légende’, and a pair of chandelier earrings, named ‘La Vie Bohème’, both by Boehmer et Bassenge. With a thematic section dedicated to the Dolce Vita era along with pieces formerly owned by Doris Duke and Elizabeth Taylor, the sale embraces distinguished provenance and jewellery with a storied past. Signed pieces from Bulgari and Cartier, Kashmir sapphires, Burmese rubies and Columbian emeralds round out an exceptional sale this season. 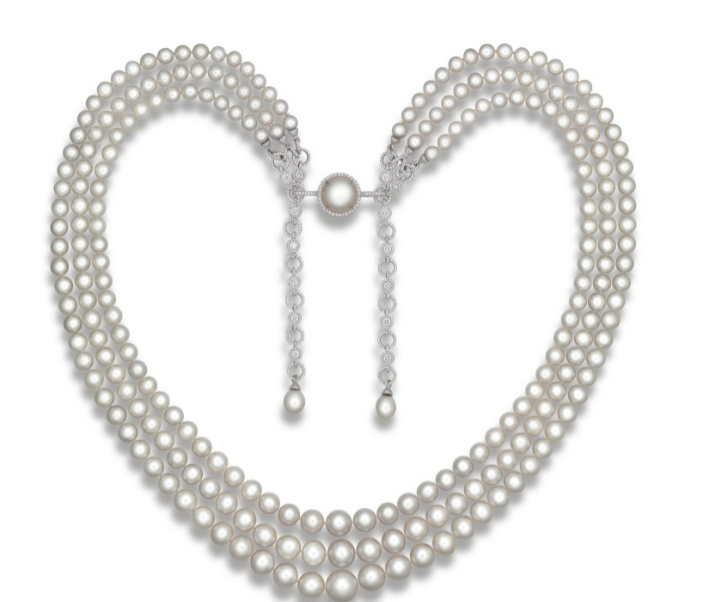 An exceptional natural pearl and diamond necklace, by Paspaley. The three-strand necklace composed of two hundred thirty-seven natural pearls gathered by a button-shaped natural pearl surrounded by circular-cut diamonds. A unique pair of natural pearl and diamond ear pendants by Etcetera for Paspaley. An exceptional colored diamond ring by Moussaiff. The rectangular-cut fancy vivid blue diamond, weighing approximately 3.98 carats, within a cushion and triangular-shaped pink diamond surround. A natural jadeite and diamond ring. The Magnificent Jewels Hong Kong auction features an assortment of natural gemstones including pearls, jadeite, and diamonds of various colors. Pair of attractive diamond ear clips. Diamonds range from 2.01 to 3.08 carats. Accompanied by ten photocopies of GIA reports, stating that the diamonds ranging from 2.01 to 3.08 carats, are D to F Colour, Internally Flawless to VS2 Clarity. Important diamond ring by Van Cleef & Arpels. Set with a step-cut diamond weighing 21.60 carats, between tapered baguette diamonds. 'Apollo & Artemis' fancy blue and fancy pink diamonds. Superb and extremely rare fancy vivid blue diamond. The pear-shaped fancy vivid blue diamond of truly and outstanding color and purity weighing 14.54 carats, mounted as an earring with a pear-shaped and a brilliant-cut diamond, post fitting. Accompanied by GIA certification. The pear-shaped fancy intense pink diamond of fine color weighing 16.00 carats, mounted as an earring with a pear-shaped and a brilliant-cut diamond, post fitting. Accompanied by a GIA certification. Sotheby’s spring sale of Magnificent Jewels and Noble Jewels at Mandarin Oriental, Geneva will be led by the ‘Apollo and Artemis Diamonds’. Individually, these captivating diamonds – one Fancy Vivid Blue, one Fancy Intense Pink – are truly exceptional stones and when considered as a pair, they enter a class of their own: the most important earrings ever to appear at auction. Offered separately as individual lots, ‘The Apollo Blue’ will be presented with an estimate of CHF 38,125,000–50,160,000 ($38,000,000–50,000,000) and ‘The Artemis Pink’ is estimated between CHF 12,545,000–18,060,000 ($12,500,000–18,000,000). The sale features jewellery from different collections comprising signed jewels and superb gemstones. Gems from Kashmir, Burma, Colombia rub shoulders with signed jewels from the most iconic and well-known jewellery houses, such as Cartier, Van Cleef & Arpels, Lacloche, Bulgari, Schlumberger and Tiffany. A Fine Natural Sapphire and Diamond Ring. Numerous round pink sapphires, yellow stones & round diamonds. Antique Gold, Tourmaline and Sapphire Cross Pendant, Tiffany & Co.
Doyle will hold the Spring 2017 sale of Fine Jewelry at The Paley Center for Media in Beverly Hills on Monday, May 22, 2017 at 10am (Pacific). Our West Coast sales of Fine Jewelry attract hundreds of bidders vying for exquisite designs consigned from prominent private collections and estates. The range of offerings includes stylish jewelry for garden lunches to glittering statement pieces perfect for the red carpet! Australian scientists said Wednesday that they have uncovered a "very rare" 2,000-year-old natural sea pearl while excavating a remote coastal Aboriginal site. The pearl is the first found on the continent. Kat Szabo, an associate professor at the University of Wollongong said that archaeologists came across the pearl while excavating the site on the north Kimberley coast of Western Australia. "Natural pearls are very rare in nature and we certainly -- despite many, many (oyster) shell middens being found in Australia -- we've never found a natural pearl before," Szabo, who specialises in studying shells at archaeological sites, told AFP. The pink-and-gold-coloured pearl is almost completely spherical, and measures five-millimeters in diameter. Because the pearl was nearly perfect round researchers were able to use a micro CT scan to test its age as well as prove that is was naturally occurring rather than a modern cultured pearl. Pearl producing oysters have been used in rainmaking ceremonies in indigenous cultures, and their shells have been found in the central desert more than 930 miles away. Archaeologists have known about the rainmaking rituals but were not aware of how far back in history they had been practiced until now. "Studying the pearl has led us to the study of the layer in which it's found," Szabo said. "In indigenous terms, that's telling a really interesting story about a cultural tradition to do with pearl shells which we knew historically but we've never been able to prove that it went back into the past." The pearl is set to go on display at the Western Australian Maritime Museum in Perth later this month, with details of the find published in the Australian Archaeology journal.